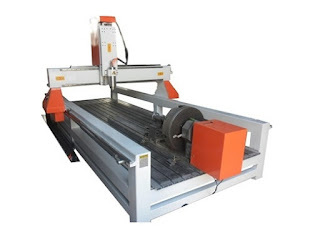 Stone CNC Router, the machine believe many contact carving knife, carving machine industry personnel are aware of, here we can not be introduced, this article mainly stone CNC Router motor fault types, and how to solve an introduction. The first case is the stone CNC Router ( http://www.roc-tech.com/product/product35.html ) motor appears to reverse the situation. Staff need to check the motor line, because this situation is generally lack of phase of the motor line, you can also directly to the output UVW terminal exchange. The second case is the stone CNC Router motor operation when there is noise. Appear this kind of circumstance are generally stone CNC Router motor internal failures, this situation must send producers there repair or replacement; if it is a stone CNC Router motor overload, then to adjust speed. Third, stone CNC Router motor speed is very slow. This is the stone carving machine motor power problems, we are generally the first to check the cable to connect the stone CNC Router, check whether there is a short-circuit, may check the motor shortage phase. In the fourth case, the motor of the stone CNC Router is hot. This kind of situation, the problem is the stone carving machine cooling system, we generally through the inspection of the pump is working, and circulating water there is no cooling lowest level this two kinds of methods to carry out. Stone CNC Router motor fault types and the solution of the solution almost on the four, if the users have also found other types, you can contact us for a discussion.